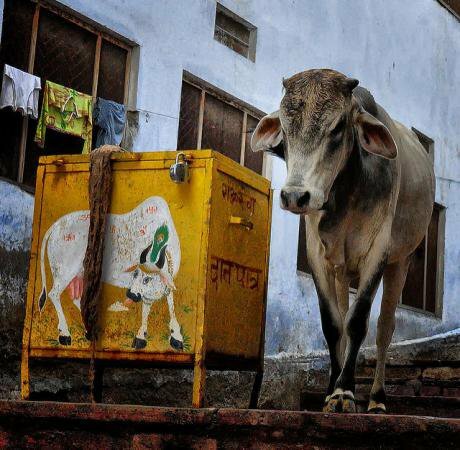 Holy Cow Container, India, 2012. Flickr/ Rod Waddington. Some rights reserved.This is the fifth article in a series on ‘confronting authoritarian populism and the rural world’, linked to the Emancipatory Rural Politics Initiative (ERPI). The article opening the series can be read here. Food cultures have become a battleground for authoritarian populism. Moral panics around food have fanned violence with impunity. Gastronomic Islamophobia is becoming commonplace because it rests on framing the relationship between the self, state, food, nature, and rural society. Any resistance to it must be equally comprehensive. “There are two sides to this”, said Gulab Chand Kataria, the Home Minister of Rajasthan. He was responding to the mob lynching of Pehlu Khan, a 55 year old man who had purchased some dairy cows in Alwar, in the north-west Indian state of Rajasthan. Khan and others were transporting the cows to Jaisinghpur in neighbouring Haryana in a truck, when a mob stopped them and, with cellphones out to record the dispensation of justice, beat him to death with iron rods and bricks. No arrests have been made. Superficially, this equivocation sounds like Donald Trump’s remarks after the murder of Heather Heyer in Charlottesville VA, when he offered that “there were some very fine people on both sides.” Whether from Kataria or Trump, even-handedness serves both as a wispy rebuke of, and a pat on the back for, supremacists of different stripes. In the rare moments where state authoritarians are equable, mobs receive their license to kill. But while Trump and Kataria share an uncharacteristic ambivalence in their pronouncements in the wake of a murder, Khan’s death shows something more. His killing was an act of adjudication over citizenship, culture, gender and life, in a form that’s becoming increasingly widespread. In the US, India and through parts of Europe, populism is lived through an Islamophobic gastronomy. In Northern Italy, the Mayor of Cittadella and member of the Northern League has banned kebabs, on the grounds that “this food is certainly not part of our tradition and of our identity”. At 30,000 feet, a headscarf-wearing Muslim chaplain was denied an unopened can of diet coke because the flight attendant thought she’d use the can – possibly together with a tube of Mentos – as a weapon. From undercover sleuthing on the BBC’s Rogue Restaurants series that conflates citizenship status with food hygiene, to the possibility of purchasing pork-fat-dipped Jihawg bullets, populist gastronomy thrives. From undercover sleuthing on the BBC’s Rogue Restaurants series that conflates citizenship status with food hygiene, to the possibility of purchasing pork-fat-dipped Jihawg bullets, populist gastronomy thrives. In India it is given its authoritarian bent by a Hindu supremacist government. Consider the murder of Mohammed Akhlaq. Although he died at the hands of a mob, it was the meat in Akhlaq’s fridge that killed him. Toward the end of 2016, at a temple in north western Uttar Pradhesh, a Hindu priest accused the Muslim Akhlaq family of eating beef. Around 100 villagers pulled father and son from the house and beat them with bricks. Akhlaq died and his son Danish was recently discharged from intensive care after multiple brain surgeries. The Senior Superintendent of Police moved swiftly. The meat was rushed to the local forensics lab. Turns out it was sheep, not cow. Several Indian states have banned beef, on the grounds that Hindu sensibilities might be offended by the killing of cows. Yet death is necessarily an intimate of living reverence. What happens to sacred cows when they die? Hinduism offers conflicting answers for what happens to their souls. Their bodies’ fate is more quotidian. India is the world’s largest exporter in the combined category of beef/buffalo. The work of turning dead cows into leather employs 2.5 million people, mainly Dalit Hindus and Muslims. It is this leather that wraps the balls used in India’s $5bn cricket industry. Hindutva involves a re-purposing of religious texts and superstitions in the national interest. Killing follows. The Emancipatory Rural Politics Initiative recognizes that populism both happens somewhere and is an attempt to make somewhere. As Jacques Rancière suggests, populism serves “simply to draw the image of a certain people”. For every imagined community, there’s an imagined geography, ecology and gastronomy. One of the central cultural vectors of authoritarian populism is the original link between rural and urban politics: food. The Emancipatory Rural Politics Initiative recognizes that populism both happens somewhere and is an attempt to make somewhere. The people who figure in populism don’t just live somewhere, they eat something, and in so doing, enter relationships of life and death with an ecological order. European liberal democracy adjudicates these relationships through rules on what can and can’t be eaten and killed, and who is licensed or unlicensed to do the killing. Populism in America’s sacrifice zones has these relationships too: as Dana Loesch draws it “Coastals (on the US East and West Coast) think they understand firearms because they watched a TV movie about Columbine …Flyovers (the states in between) get a deer rifle for their thirteenth birthday.” Hindutva adjudicates who can kill and eat, and what can be killed and eaten too. You can trace these orders through their moments of crisis. As the first in this series of posts observes, one tool to do that is the “moral panic”, a term used by Stuart Hall and his comrades in their seminal study Policing the Crisis. For them, the moral panic around mugging was an optic through which they could look into the hegemonic crisis of 1970s Britain. Moral panic became an “index of the disintegration of the social order.” Think of our current moment as “food policing the crisis.” Social panic around food and hygiene is always a concern about order, a signal of crisis. Authoritarian populism fixes the moral panic in rural northern India through the police and its cognates in the Hindu priesthood. Neoliberalism’s secular boundaries between self, society and nature have never been enforced with total success, in post-Independence India or anywhere else. Insofar as the technologies of coercion, nitrogen-fixing, monoculture and marketing were able to secure the consent of key segments of rural India through increased incomes from their land, this might have been smoothed over. No more. Populism emerges at a moment of ecological state-shift. The soil on which Indian rural life depends is dying: 44% of the country suffers land degradation. Khan and Akhlaq’s killings happened in zones of high soil salinity, a consequence of the country’s Long Green Revolution. Amid the ecocide of industrial agriculture, Hindutva invents a tradition that offers an alternative. It’s a different way of parsing relationships with other beings in the web of life, and one that offers salvation in ways that neoliberalism cannot, in conditions neoliberalism created. Rural populism in northern India is nourished by capitalism’s infertile soil. The soil is dying…Rural populism in northern India is nourished by capitalism’s infertile soil. The state is doing its part, of course, to abet this salvation. The Indian government has cow shelters, and is in the process of acting as a guardian through an $8bn bovine biometric identification scheme yet more Orwellian than the one that already registers its human citizens. But the state is merely the embodiment of the people. Hence the license, indeed the imperative, for citizens to police the crisis themselves. Such are the seductions of this politics that even the Bharatiya Kisan Union, a member of La Via Campesina in Northern India, have participated in it. If Ramakumar’s analysis is correct, fissures in the BKU’s prior solidarity between Hindu and Muslim emerged through class tension, flaws within the organization’s processes, and rural-urban tensions. The concrete example: urban Muslims’ ownership of a meat-processing plant as an inciting influence behind BKU’s participation in the Muzaffarnagar riots. As Achin Vanaik observes, for emancipatory rural politics to succeed, “we need to fight against more than communalism”. Communalism offers a way of parsing the crisis, of living through it in moments like the panic around cow killing. One doesn’t solve that by insisting that, to the contrary, killing people is bad and killing cows is OK.
Authoritarian populism has its political ecology, one that threads humans’ relationships with other species. A response to this crisis will involve far more than a demand for different religions to get along. Confronting authoritarian populism will need, centrally, to offer a far more comprehensive renegotiation of human relations to one another and the web of life. A response to this crisis will involve far more than a demand for different religions to get along. Rural populism recognizes the state-shifts that capitalism has wrought. Emancipatory politics will need to reweave those relations, undoing the supremacies and patriarchies that such populism rests upon. This will require in the words of Donna Haraway, learning "to revoice life and death in our terms" and not accepting "the rationalist dichotomy that rules most ethical dispute". The forms of that revoicing are precisely the tasks, and stakes, of emancipatory rural politics.